Despite the bad news about cars and the cities they have ruined, we can report that we saw some amazing transit systems during our recent walkabout. Okay fellow transit nerds, herewith, three examples. 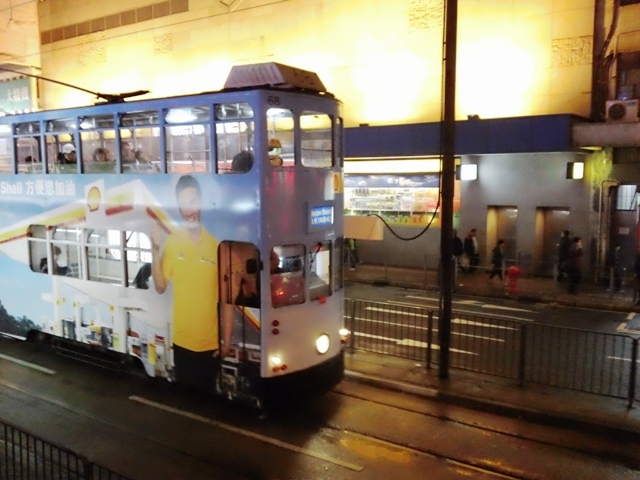 In Hong Kong, we delighted in riding the double-decker streetcars. The system, now over 100 years old, is wholly owned by a private entity: Veolia Transport. Fare is HK$1 for us gray hairs, HK$2 for others. The system has 161 cars, 30km of track and 118 stops in its entirety. Heavily used (80,000,000 riders annually), the system runs on 1.5 minute headways at peak operating hours (no, that’s not a typo – 1.5 minute headways. 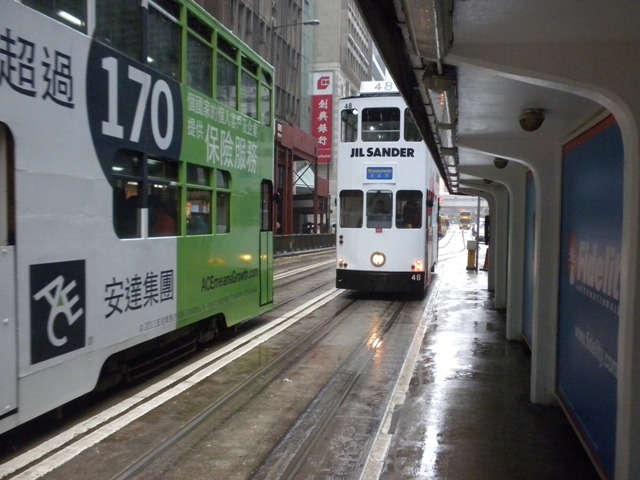 Practically a moving sidewalk of trams !!). This is true no-frills transport. Enter at the rear of the car, sit if you can find a seat, plug a $1 coin in the box as you leave up front. Oh, and pick up your feet – they ain’t kiddin’ about the tight schedules. Downtown stops have shelters – it rained and rained on us – but elsewhere not. There is absolutely nothing fancy about this system, but it really works. 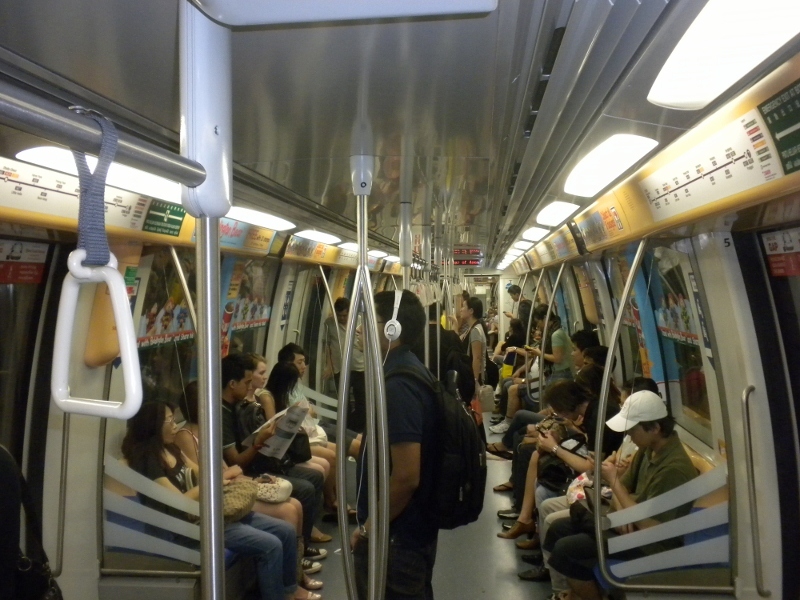 In Singapore, we rode the subway, and we can report that while we have not ridden every subway system on the planet, this is the best we have ever seen by some distance. During planning for this system in the 70s, a bus-only system was considered, but planners concluded that the requisite flood of additional buses would fill roadways already groaning with traffic. So in the 80s Parliament opted for a subway. Good choice, Parliament. Even as the basic system opened, Parliament understood the need to continue the expansion of the system, and this expansion continues today. Today, the system comprises 130 kilometers of track, and carries about 2 million people a day, or 744.8 million people a year, making it the 15th busiest subway in the world (Singapore is the world’s 33rd largest city – folks there like their transit). 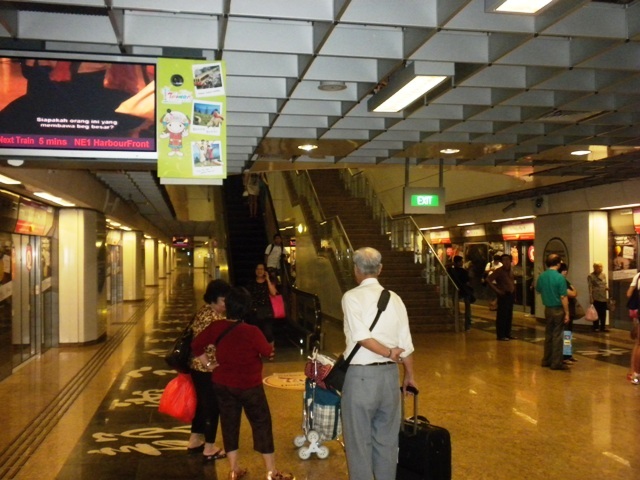 We can report that, as any good system must be, the MRT in Singapore is completely intuitive to use. Really clear, really simple. We found ourselves easily upgrading and exchanging our credit card-like tickets – piece of cake. And the system is gorgeous, spotless, quiet, and comfortable. Anybody know of a better system? 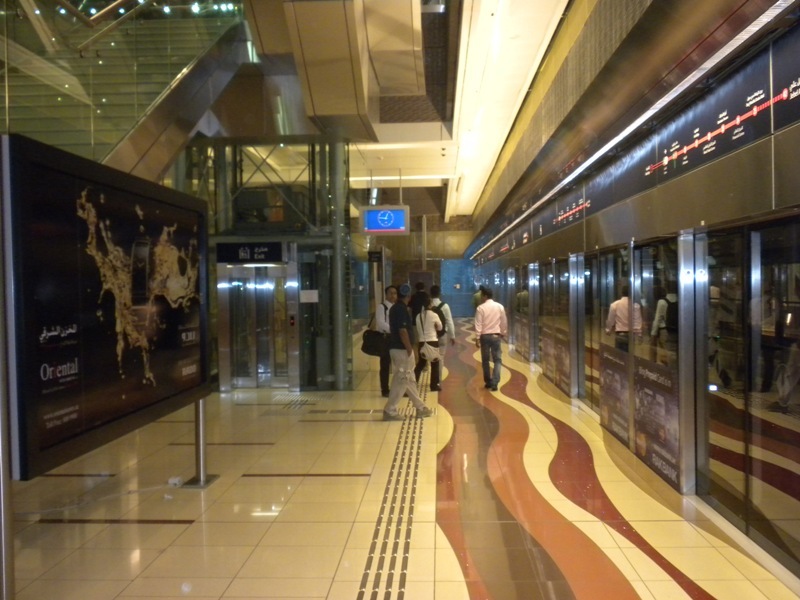 In Dubai, we rode the subway all over the place, on its runs both above and below grade. And guess what? 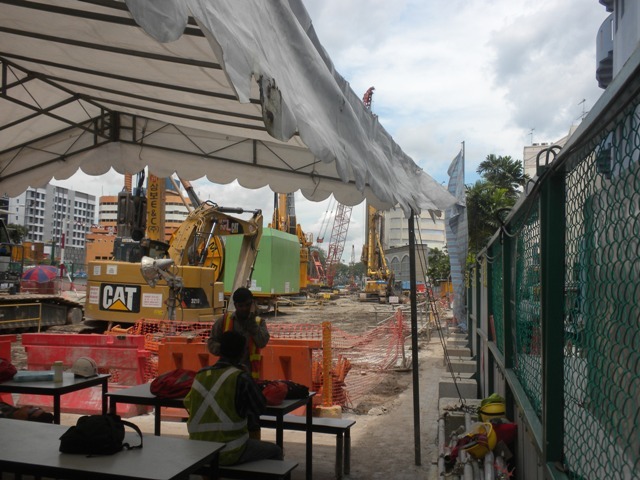 It is a direct and complete knock-off of one of the best systems that exists: Singapore’s. But for the station tile patterns and a few other quite minor variations, they are interchangeable. We rode the Dubai system one afternoon when it was absolutely packed – jammed to the limits – and it was still remarkable in every way. How could you go and see this, without a terrific subway system? 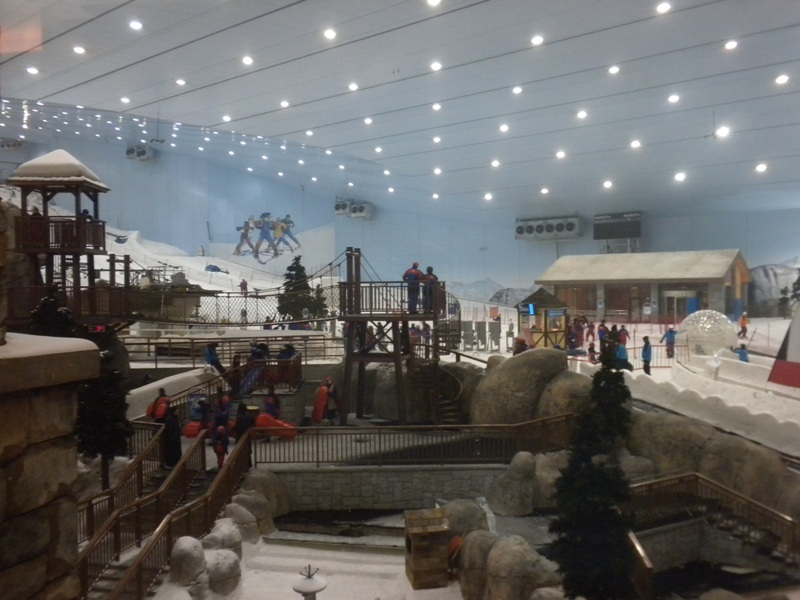 Skiing, Mall of the Emirates. Completely goofy, but then so is Dubai. And then we came home to our humble, mostly unusable bus system. Maybe if we built a giant indoor Hawaiian surfing park at Eastview Mall, we could get better transit…. The probelm in most of the United States is that most people don’t know what good public transit is and have been taught that public transit is by nature inconvenient when in fact if properly designed and funded it is far more convenient than travel bay car within urban areas. Anyone who has been to Paris can attest to this. Silly myopic Americans. Great post! My puny American brain can’t even fathom 1.5 minute headways. Howard, these are all pretty large cities. I think dubai is probably the smallest at 3 or 4 million? Did you come across any notable intracity transit systems in more modestly populated towns? What would Rochester look like if it were disassembled and rebuilt in China or Japan? First, Dubai is smaller than you think – just under 2 million in the 2010 assessment. The recession hit Dubai pretty hard, and development is becalmed there at the moment, so any big population increase is not likely soon. As to smaller towns and transit in comparison to Roch, the closest in our wanderings was Wellington, NZ. Wellington, the nation’s capital, is just under 400,000. Wellington has a bus system, a ferry system, and a cable car that goes up the hills to Victoria University and the Botanic Garden. They had a streetcar, of course, and ripped it out, of course (last line closed in 1964), and now, of course, there is a strong movement to reconstruct a street tram. Traffic is pretty rough, in our observation, and additional transit tools would really help. You can check out the advocacy group in Wellington at http://www.trans-action.org.nz. The site isn’t pretty, but the information is quite good. They could use your deft design eye. As to relocating Roch to China, or Japan, our city wouldn’t be very visible at all. Especially in China, where cities are huge and getting huger. In China, a municipality of a million is just a small town. Scary, but true. But the fact that we live in a smaller city, and region, than many in China, certainly does not abridge our need to have access to enhanced transit. I note that one of the things we found interesting in so many of the cities we visited was the range of transit tools present. 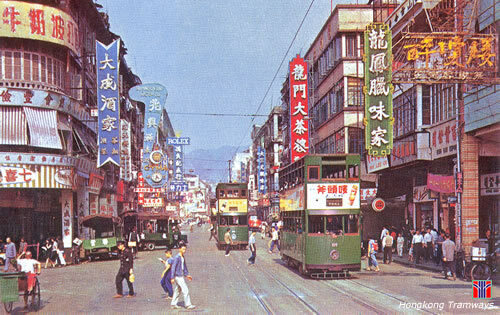 Access to four or five modes was not uncommon at all: ferry, in the cities with lots of water, subway, bus, heavy rail, and then often tram (HK) or monorail (Sydney), or light rail. And in China or Japan, high speed rail. The best examples of cities of our size now constructing enhanced transit are probably to be found in France, or Germany. In France, there is a whole slew of smaller cities with transit projects in construction: Amiens, Angers, Brest, and many others. You could look it up – these are cities of our size, or smaller, in similar sized or smaller regions.